This original artwork is a 2016 oil on canvas and depicts nature, people and emotions. The size of this art painting original is 18 x 22 in. Select Print Medium Fine Art Paper Canvas Select a Size 12x15 in. 17x21 in. 29x36 in. 34x42 in. Exchange of Glances by Conchi Ororbia features the portrait of dapper young lad with a tender butterfly perched on his hand. This piece is composed in bold expressionist technique in shades of blue, orange and red. Shipping for this original piece of artwork will be 14 business days. Signed by the artist on the Front Bottom Right. Conchi Ororbia Liberal was born born in 1959. She comes from a northern village in Spain (Artajona). She started painting at the age of 10 and she specialized in oil painting, watercolor and acrylic. Today she continues her artistic journey, which includes researching techniques, trials, sketches, designs, drawings… all in an endeavor to constantly improve herself and her art. Her work is based on glazes, filings, graphics and the study of using color to arouse emotions in the spectator. She plays with color schemes as she creates both figurative and expressionist fine art paintings. She has exhibited her work in different countries and cities around the world, including New York, La Toscana, Monaco, Paris, Stockholm, Lithuania, Madrid, and Barcelona. This romantic portrait painting features a couple in love whispering gently to eachother. 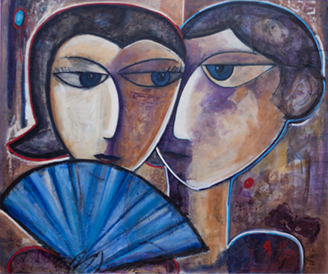 This painting is composed in tawny tones with accents of blue and red. 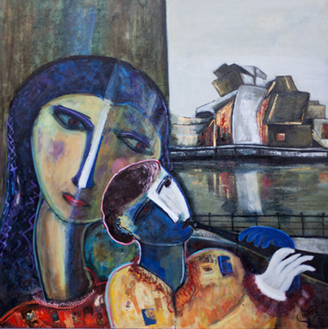 Between Two Waters by Conchi Ororbia combines the figurative style of renaissance artists with the unique style of Pablo Picasso to create a complex painting celebrating both eras. This piece also adds expressionist colors and technique which develops the completely unique experience this painting presents. 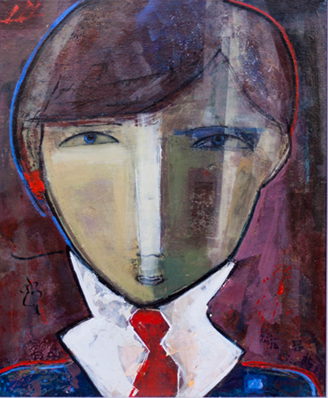 Youth Potion by Conchi Ororbia is a classic portrait painting that communicates the charming wit and intense stare of a young businessman. This painting would fit well in an office environment.